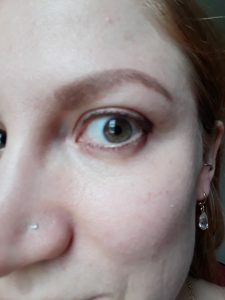 If you’ve been around this community for some time, you’ve probably noticed that I have a somewhat silly obsession with the quality of my skin. I want to be youthful, radiant, dewey–and to do so forever. I know it’s ridiculous, and my self esteem doesn’t depend on it. But I would enjoy the look. For better or for worse, I would like to look as springy and vibrant as I feel. About two months ago I stumbled onto this skin- and muscle- healing concept called red light therapy. Now, I’m really, really, REALLY skeptical about new age sounding therapies. “Red light therapy? !” I snorted violently. I may as well wear a crystal around my neck and call it a day. I almost dismissed the idea out of hand. But, there were all these success stories staring me in the face, so I decided to do some research. 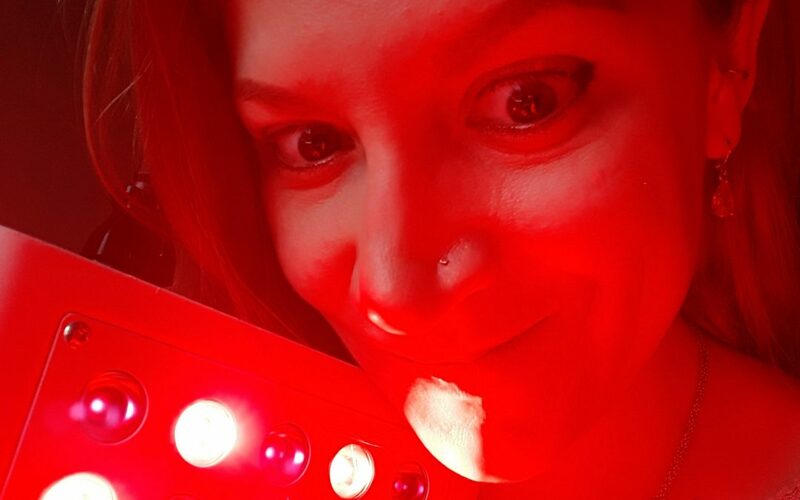 As it turns out, red light therapy is legit science. It was first discovered on a NASA spacecraft out in orbit, when light in the red wavelength area of the spectrum stimulated plants to grow faster. (It has also since been shown to target and kill cancer cells.) Dermatologists thought this idea was fascinating, and wondered if these kinds of regenerative growth processes could work in the skin, too. And they do. Somewhat miraculously, even. Within years of the discovery of red light in space, salons providing red light therapy popped up around the western world. Some women spend hundreds of dollars a month to go to salons with red light beds. It is also now possible to purchase a device and use it in the comfort of your own home. Unfortunately, these devices range from the scammy to the ineffective to the monstrously expensive. I was therefore incredibly fortunate to stumble upon a company called Joovv. Joovv is a red light therapy company created by the wife and husband team of Melissa and Justin Strahan. Melissa first tried red light therapy at a salon, back when it was first emerging onto markets. She saw somewhat miraculous results on the quality of her skin and her stretch marks, and she fell in love with it. But going to the salon was expensive and inconvenient. Justin, Melissa’s husband, is an engineer. He undertook the task of designing the most efficient and effective red light for Melissa that he could. Now with patents pending, the Joovv company services an enormous number of people with extraordinary customer service and care. If you go to their website, here: Joovv, you’ll see that they have more than 50 five star reviews, and are supported by people like the paleo fitness star Ben Greenfield and the Harvard doctor who specializes in photobiomodulation Michael Hamblin. Joovv, amazingly, has a 60 day money back guarantee. So I figured I had nothing to lose. I ordered a light. They shipped it to the UK and it arrived in two days. After about three weeks of using the light for 5 minutes every day, I began to understand what everyone was raving about. Do you know that particular dewey, radiant, sort of soft and sparkly kind of skin that magazine models always seem to have? And you think, wondering – that must be photoshopped. And it certainly is. But then every once in a while you make an acquaintance who has skin like that in real life, and you wonder, oh my, how does she manage that?! Well. I always wondered that. I always thought, man, that would be the dream. And, I also always really hoped that I wouldn’t age like the other woman in my family did. That is, very early, and very wrinkly. I didn’t need smooth skin to be happy, not by any means, but I thought it would be nice. And I can say now with 100% honesty I actually have this kind of skin. I didn’t think it would ever happen, but here I am, it really did. There’s a particular smoothness and glow about my face that never existed before. So much so that light reflects off of it (lol). And my pores, I think, are smaller. The chronic redness I carried on my cheeks for as long as I can remember is gone. Last week I ran into an old acquaintance and they said ‘wow, you look really refreshed. like you’re really well slept, and golden.’ These were all real words that they used, and I promise you I was not well slept. 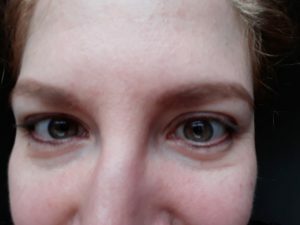 The fine lines that have recently appeared as crows feet, I am a bit amazed to share, have also softened. On my right eyes they have disappeared. they’re still hanging out on the left eye, but I’m all right with that. I’m only about five weeks into the therapy, and already super happy with the overall results (I intend to keep you posted about it, and if my experience turns south, I will definitely let you know). I have zero desire to cash in on the money back guarantee. In fact, I’ve considered paying Joovv more money simply to say thanks. 1) Red light therapy stimulates the production of collagen. Collagen is responsible for firmness and elasticity, which is what causes the reduction of pore size, as well as fine lines and wrinkles. I’ve read that this can take a bit longer than the other effects to show, so I will keep you posted on any progress in this regard. 2) Red light therapy increases circulation and the formation of new capillaries in the skin. This delivers more oxygen and other nutrients to your skin, which helps it rejuvenate itself. this may have something to do with my transition from a somewhat irritated red to healthy gold/pink glow I’ve got going on. 3) Red light therapy increases lymph system activity, which reduces swelling and puffiness. 4) Red light therapy causes the release of cellular ATP in the skin–which is the form of energy cells need to stimulate growth and repair. All in all, I’ve been super happy with these results. I am not trying to sell you anything. But I do think this information is fascinating and important. Whenever I notice science doing something cool for my body, I feel compelled to share. If you’re into this sort of thing, science may be able to do a cool thing for your body, too. Red light therapy is known to reduce stretch marks (I have yet to shine the light on my inner thighs, but will let you know when I do), reduce certain kinds of acne, heal sunspots and other discolorations, even out skin tone, reduce the appearance of fine lines and wrinkles, and create a more healthy glow. This is because it actually does heal the skin, in a way that is deep and real. If, again, you happen to be into this sort of thing, I couldn’t recommend Joovv more highly. 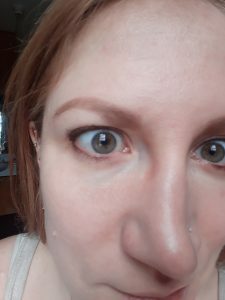 They make a full face machine which is great; most red lights you’ll find online are tiny spot healers that can only do a couple inches of skin at a time. Joovv’s customer service is outstanding, and their dedication to crafting machines that make the perfect wavelength and intensity of light (very important for its effectiveness) is unparalleled. Most of all I love their money back guarantee. They could lose a ton of money this way, by shipping people their fragile lights all over the world with the possibility of having them all returned. But I am willing to bet this turns out great for the company. If other people have a similar experience to me–even starting out as a raging skeptic–they’re not going to want to return their lights, either. Here are some photos of my skin. It’s hard to be accurate because cameras tend to be really forgiving anyway, so there’s less contrast between the ‘before’ and ‘after’ than in real life. Interestingly, today instead of being grateful for the camera’s typically glossing-over features, I am regretful that it hides the dynamic shine to my skin. Again, it’s really hard to show the contrast. What I’m seeing most of right now is a reduction in redness, a smoothness I’ve never experienced before, and this kind of healthy, glowy quality I’ve always wanted. Plus a little bit of progress with the fine lines. So, that’s a wrap! Just wanted to fill you in on a cool experiment I’m up to. Do let me know your thoughts if you’ve got em! Thank you so much for this post. 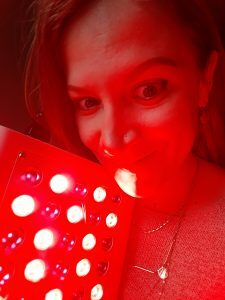 I have been looking at red light therapy to help with my acne scarring – I was wondering which size of the Joov machine you purchased, and do you think this will work for acne scarring? Hi Stefani, I recently came across your blog and I am going to write you personally to say that I CANNOT THANK YOU ENOUGH FOR ALL THE INFORMATION YOU HAVE PUT OUT TO THE WORLD! 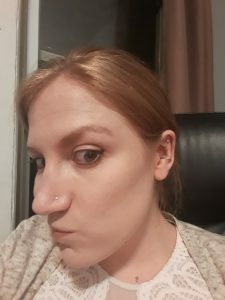 I think your blog and books should be required reading for all dermatologists, seeing as you clearly have so much more information on hormonal skin issues than any of myriad dermatologists I have seen over the past 20 years! More on that separately, though. Specifically re this JOOV product though, which of the three levels of light did you choose? The middle one? I thought the middle option looked like a good combo of both; curious about what you went with though. Thank you! oh, you’re too nice 🙂 thank you. i just, have very sensitive skin, so i’ve had to work very hard and learn a lot to heal myself. I do actually have the middle option, the mixed wavelength light. interestingly enough i think it might have helped heal some optic nerve issues i have (?!?!). In a pretty robust study (https://www.ncbi.nlm.nih.gov/pmc/articles/PMC3926176/) it was demonstrated that the mixed light has the same skin healing benefits as the full on red wavelength light. Thank you for this info and for sharing the study you came across — I can’t wait to try this product! Thank you again for this and for your work generally – in two weeks, the info in your blog, podcasts, and your new book have healed my skin problems that I have had for 20 years; so thankful for you!! Hi Stefani! I am a listener of the wealth and women podcast in recently purchased your book clear skin and light. 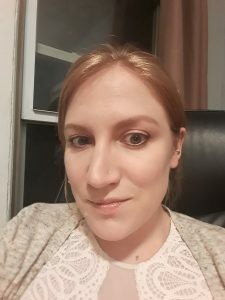 I am hoping to heal my cystic acne after coming off of Spironolactone (sp?) which I previously used to manage it. A little bit of history-I am a chronic over exerciser and under either and deal with amenorrhea as well. I am trying to heal all of these things. I just purchased your book in and eager to get started. 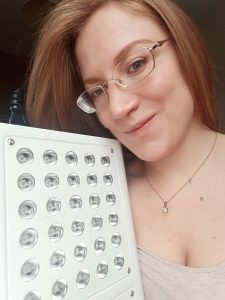 My question is, should I dive into red light therapy now or is it better to implement the other diet, stress reduction, and sleep recommendations first? 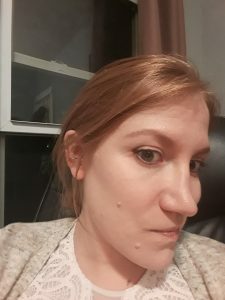 I am 38 years old and have been dealing with cystic acne since my early 20s. Hi, I would like to buy a Joovv light. I also live in the UK and wonder if you can remember roughly how much import duty you had to pay? I know 20% VAT will be added and am pretty sure that I will have to pay additional duty too. Also, which model did you purchase? Was it the one with both IR spectrums? I am a bit late to the party but I live in the UK and have been wondering how to get my hands on one of these when I saw your post! It’s great to see how it has benefited you. Do you just use it with a standard plug adapter? I am not sure about voltages etc but I know that the US and UK are different and I’m always wary of using electrical equipment in other countries. I assume you’ve found a way to use it safely in this country, so if you could let me know how that would be great! Thank you in advance.